TORONTO – Midway through his first year playing hockey in North America, Calle Rosen had an epiphany. The Maple Leafs’ defence prospect was navigating life with the AHL’s Toronto Marlies, fruitlessly searching for ways to take his game from ordinary to excellent. Finally, right around New Year’s, a realization hit that would change his season. Indeed, Rosen’s numbers with the Marlies’ showed a distinctive spike from early January on. The 24-year-old produced only eight assists in his first 31 AHL games, but his increased consistency led to nearly double that total (14 points) in the next 31 games leading up to the Marlies’ Calder Cup playoff run. The postseason is where Rosen really shined – just ask Leafs’ general manager Kyle Dubas or head coach Mike Babcock. In recent weeks they’ve both praised Rosen as the Marlies’ best defenceman when the team won the first Calder Cup in franchise history. Being a minor-league player isn't exactly what Rosen expected when he and countryman Andreas Borgman left the Swedish Hockey League to join the Maple Leafs on identical two-year, $3.55 million contracts last spring. Both had interest from other clubs at the time, and both chose Toronto. Then neither spent the entire season in the NHL. Rosen earned only a four-game tryout early last October, tallying one assist with a minus-3 rating. He spent the rest of the season in the AHL, save for an emergency recall in March that didn’t result in any ice time. 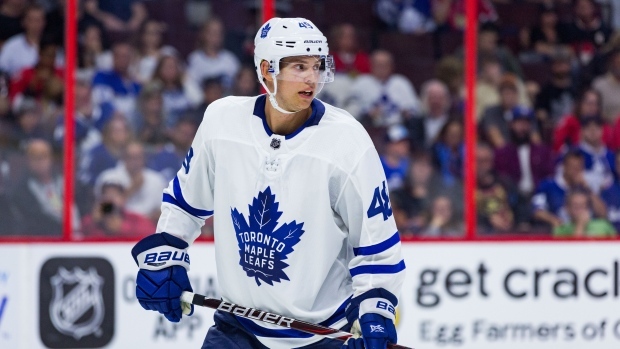 Borgman had a longer NHL audition, skating in 48 games before being sent down in early February after Travis Dermott began to flourish on the Leafs’ blueline. Borgman found his footing with the Marlies quickly, producing nine points in 25 games before the postseason. From there, he and Rosen took diverging paths to the end of the season. In Game 1 of the Marlies’ first-round series against Utica, Borgman suffered a lower-body injury that cost him the next four games. When Toronto's second-round series against Syracuse began, the 23-year-old felt recovered enough to play, but aggravated the same injury and was shut down. The setback did, however, give Borgman a front-row seat to Rosen’s terrific run. Paired with Vincent LoVerde, Rosen felt the duo established good chemistry early and managed to grow stronger every game. Clutching lessons from those new experiences, Rosen entered Leafs’ camp cautiously optimistic about his chances of landing an NHL spot on opening night. But the numbers game on Toronto’s blueline won’t be easy to overcome. Outside the locked-in top-four defencemen, Rosen is battling with Borgman and Dermott to start on the left side of the team’s third pairing. To win out, Babcock says Rosen needs to harness more of the physical gifts his 6-foot-1, 195 pound frame offers. Borgman has more physicality in his game, but struggled with decision making and explosiveness in the NHL. He worked hard fine-tuning his game this summer. With Dermott slowed by a shoulder problem suffered in Tuesday’s preseason game, it appears there’s opportunity to gain ground in the race, but injuries aren't how Borgman wants to earn his position.